Mount Muji is the highest point in Japan. Japan’s northernmost point has been disputed for several years. Iturup, an island, is considered by Japan to be its northernmost location. However, the island is also claimed by Russia which has control over it. Therefore, the undisputed extreme north in Japan is a small deserted island northwest of Cape Soya called Bentenjima. The island is located in Wakkanai in the Hokkaido prefecture, approximately one kilometer north of Sannai settlement.Bentenjima Island covers an area of approximately 0.0019 square miles and has a perimeter of approximately 0.31 miles. The highest point on the island is about 20 meters above the sea level. The wildlife of Bentenjima includes seabirds, sea lions, and sea urchins. The island was named after Benzaiten, a Buddhist goddess who was once enshrined on the island.The northernmost accessible point in Japan is Cape Soya. It has the monument of the northernmost location of Japan. The cape is approximately 43 kilometers from Russia’s Sakhalin Island and has several facilities including a lighthouse, filling station, and an elementary school. The southernmost location of Japan is the Okinotorishima Island also known as Distant Bird Island. The atoll is uninhabited and has a covers an area of approximately 8 hectares. It is a dry land which is mostly composed of three concrete encasing. Okinatorishima Island is located in Phillipian Sea’s Palau-Kyushu Ridge at 20°25′31″N 136°04′11″E coordinates in Tokyo Japan. It is the only Japanese territory in the tropics. According to the Japanese, the island is so significant for the country to have approximately 200 nautical mile exclusive economic zones around it. However, China and South Korea are of the opinion that the atoll cannot be categorized as an island under the UN Convention on the Law of the Sea.The Okinatorishima Island has faced the threats of typhoon and submersion due to the effects of erosion. T0 prevent submersion, the Japanese began an embankment building project and encased the reefs with concrete. A lighthouse is also expected to be built on the island. Currently, the island is an important research station for the Japanese. Minami Torishima, popularly referred to as Marcus Island, is Japan’s most extreme eastern location. It is an isolated coral atoll situated in the northwestern Pacific Ocean 1,148 miles southeast of Tokyo. The atoll is nearly on a straight line between Wake Island in the US and the mainland Tokyo. Minami Torishima is a Japanese word which means “Southern Bird Island.” It is the only territory of Japan on the Pacific Plata.The island is triangular in shape and has a raised outer rim of approximately 16-30 feet above the sea level and a central area that is approximately 3 feet below the sea level. It is surrounded by fringing reefs of varied widths, enclosing a shallow lagoon which is connected to the ocean by a narrow passage on both the southern and northeastern sides. The Marcus Island experiences a tropical savannah climate with medium temperatures throughout the year. 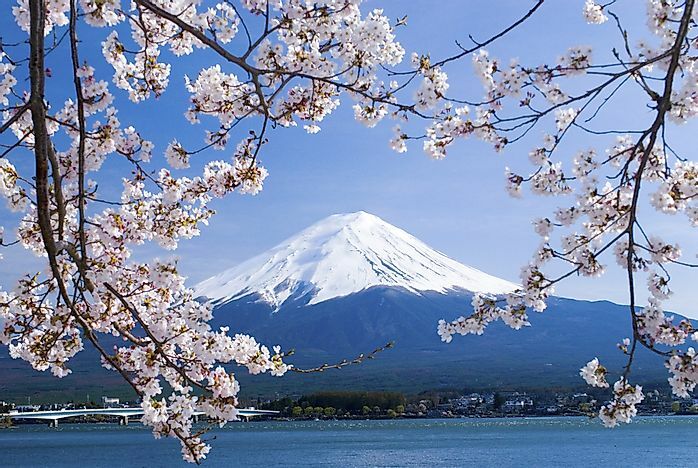 The summit of Mount Fuji is the highest location in Japan at 12,389 feet above the sea level. Situated on Honshu Island, it is the second-highest island mountain in Asia and the 7th highest peak on an island in the world. Mount Fuji is an active volcano which last erupted in 1708. The mountain is situated 60 miles south-west of Tokyo and is visible from the city on a clear day. It is one of the country’s “Three Holy Mountains” and a special place of scenic beauty. The mountain is a symmetrical cone and has a narrow snow-cap which last about 5 months a year. Mount Fuji is a popular symbol of Japan and often features in art and photographs. There are 25 sites within the mountain that have been identified by UNESCO as places of “cultural interest.” These sites include the shrines and Taisekiji Head Temple which was discovered in 1920. Japan has both man-made and natural lowest points. The natural lowest point in the country is Hachirogata which is a lake in northern Japan. Lake Hachiro is approximately 13 feet below the sea level. The lake, which was the second-largest lake in Japan, is currently the country’s 18th largest lake following an extensive land reclamation in 1957 which has reduced its area to only 19 square miles.The Hachinohe mine in the city of Hachinohe at 40°27′10″N 141°32′16″E coordinates is the lowest man-made point in Japan. At 560 feet below sea level and with digging still going on, the limestone quarry is the country’s lowest point. The open pit measures 2 kilometers long from north to south and 800 meters wide from east to west. The excavated limestone is transported to Port Hachinohe via a conveyor belt.